Welcome to Marvel Strike Force Heroes page. This is the full description of MSF Spider-Man stats, skills and abilities. Spider-Man is a vicious City Brawler with a high dodge rate who can chain his attacks and stun enemies. His first skill delivers medium damage and has a 50% chance to chain up to 1 adjacent target. In addition, Spider-Man has a chance to gain Evade. His second skill also delivers medium damage and chains to up to 3 adjacent targets applying Defense Down to each target in the process. Spider-Man ultimate inflicts heavy damage and stuns the target. His passive ability grants him 20% dodge chance making Spider-Man the hero with highest dodge chance besides Vision. Spider-Man is the first hero in Marvel Strike Force for everyone and his shards can be farmed via Mega Orbs, Premium Orbs, Spider-Verse Orbs, Hometown Heroes Orbs, Blitz Orbs, and Blitz Supplies. He is a quick attacker that weakens opponents and evades incoming attacks. Attack primary target for 120% damage + 50% chance to chain up to 1 adjacent target for 90% damage. 30% chance to gain evade. Attack primary target for 120% damage and chain up to 2 adjacent get(s) for 80% damage. 25% chance to apply Defense Down to each target for 1 turn. 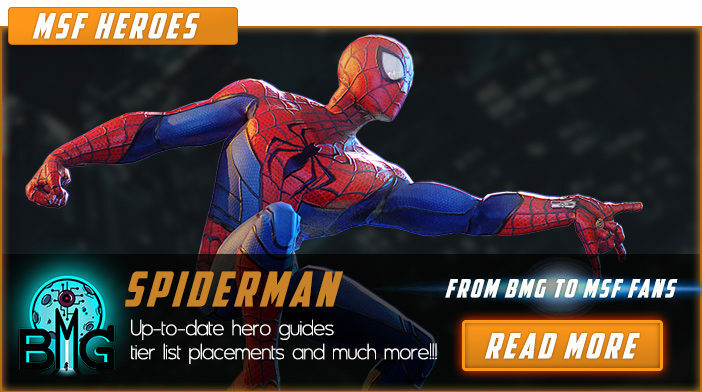 We hope that you enjoyed the description of MSF Hero Spider-Man. For detailed information about other MSF Characters check our MSF Heroes page.